Ivy Tech Community College of Indiana is the largest community college in the United States. About 170,000 students register for classes each year, and the school keeps enrollment open for two years—whether or not a student is actively taking classes—leading to an ongoing student database with about 1.7 million records. The school has close to 9,000 faculty members teaching at 23 campuses and 560 locations across the state. It also has a very large IT infrastructure that includes 1,200 applications, 24,000 school-owned PCs, 2,000 wireless access points, an average of 23 million emails transmitted daily, and about 10 TB of information downloaded each day from the Internet. Needed to scale existing systems, including operational data store (ODS), to support applications used to manage and analyze records on tens of thousands of students. Was dealing with wait times of 40 minutes for a single query and up to eight hours to process routine reports. Needed new ways to store and analyze data, such as actively monitoring student performance early in each semester to rapidly identify and counsel those at risk of failing. Faced potential costs of millions or tens of millions of dollars for data warehouse and storage solutions from several major vendors. Uses Amazon Redshift data warehouse service to perform predictive analytics and produce reports with software from Pentaho, an AWS Technology Partner, and Wolfram Mathematica. Stores raw data in Amazon Simple Storage Service (Amazon S3) buckets before uploading into Amazon Redshift. 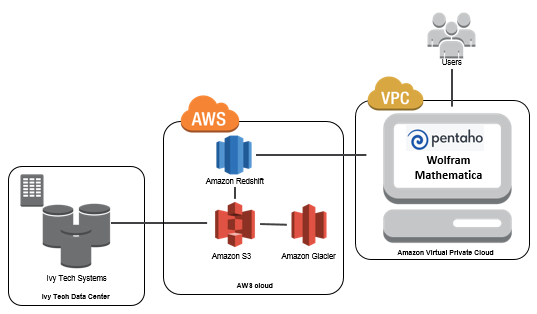 Archives data in Amazon Glacier. Queries complete in as little as three seconds, down from 40 minutes or more in the past. Gains insights from data in seconds and can detect issues like financial aid fraud that in the past might have taken days to discern. Can use machine learning for more than 70 percent accuracy in predicting students who are struggling, enabling faster intervention. Much less expensive than other enterprise data warehouse solutions, with long-term Amazon Glacier storage costs at 1 cent per GB. Licensing and monthly operational costs are about 60 percent less expensive than older ODS system. Pay-as-you-go pricing works well within community college budget constraints. Can meet petabyte-scale data needs while avoiding unnecessary IT expenses. To learn more about how AWS can help your data warehouse and BI needs, visit our Amazon Redshift details page.